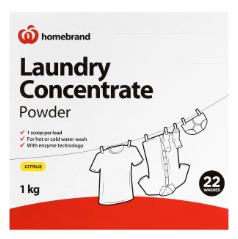 Compare laundry powders ALDI Almat, ALDI Trimat, Biozet Attack, Cold Power, Coles, Fab, Omo, Radiant, Surf and Woolworths Homebrand on factors including quality of clean, feel of clothes after wash, value for money, packaging design, scent, environmental friendliness and overall satisfaction. 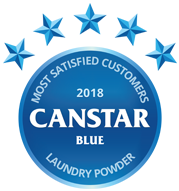 In a packed market space, Radiant has come out on top of Canstar Blue’s customer satisfaction ratings for laundry powders in 2018. It rated five stars for quality of clean, feel of clothes after wash, scent, environmental friendliness and overall satisfaction. While doing the laundry comes with risks – such as shrinking clothes or accidently turning your favourite white shirt a different colour – it is a necessary chore to keep us looking and feeling fresh. For some, the washing machine is a mystery, with many of us sticking to the tried and true method of the regular wash for everything, while others venture out to different wash settings for a more appropriate clean. Even if you’re a washing veteran, choosing the best laundry detergent for your needs can feel like guesswork. Choosing between laundry liquid and powder is the first hurdle to get over, and for those who stand by powder as their favoured laundry weapon of choice, there are plenty of options to narrow down when it comes to finding the best brand for your needs and budget. In our latest survey on the subject, 56% of respondents said they always buy the same brand of laundry powder, while 44% stock up on whichever is on special or happens to be cheapest when they go shopping. 7% of Aussies have even tried to make their own laundry detergent, indicating that some are looking to save money. With 32% of respondents stating that washing is done every day of the week in their household, finding a washing powder that does the job the first time, everytime, can cut down on the washing frequency, as well as cutting down on power bills. 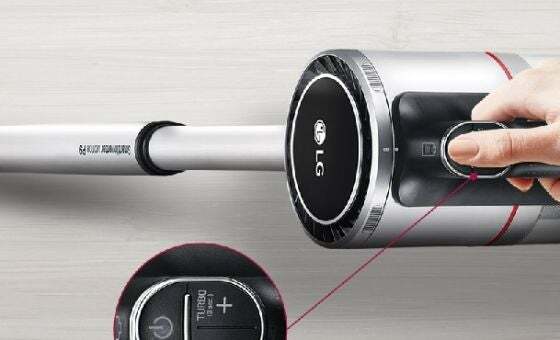 So which brand cleans up best in Aussie homes? When it comes to cleaning effectiveness, only Radiant and Biozet Attack recorded five stars. But when it comes to value for money, ALDI Almat was the only brand to achieve top marks. 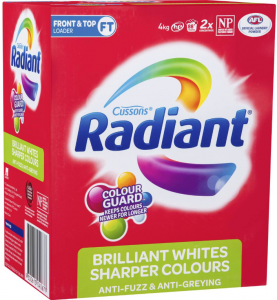 Owned by British company PZ Cussons, Radiant has been around for more than 25 years, offering a wide range of laundry products, including liquids and powders. Available at all supermarkets, as well as other retailers such as Big W and Target, Radiant has a variety of powders for all clothes types. Available in up to 9kg packages, Radiant could be a large household’s best friend. Suitable for top and front load washing machines, Radiant offers a number of powder types for different washes, helping you get the stains out of your clothes regardless of what you’re washing. With a range that includes a Sports Wash for grass stains, Brilliant White’s wash for fresher whites, No Sort powder for those who chuck all their clothes in the one wash, as well as a Sensitive wash for those with allergies and sensitive skin, Radiant has most washing needs covered. In this year’s results, Radiant achieved five stars across a range of categories, including the only top rating for environmental friendliness, feel of clothes after washing and overall satisfaction. With ALDI quickly becoming a popular option for the household grocery shop, the German chain offers a range of laundry powders for you to pack your trolley with. Offering the Trimat range in both liquid and powder forms, ALDI has a number of options for consumers, including Regular Concentrate, Colour Care and Sensitive, all retailing for around $6 per 1.5kg box. 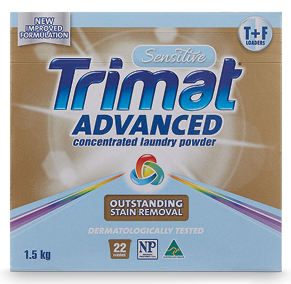 Suitable for both front and top loader models, ALDI Trimat contains pre-treaters to help boost whites and colours, along with no phosphates for a more environmentally sustainable wash.
Trimat performed consistently across all categories, scoring four stars in every section, including value for money and quality of clean. 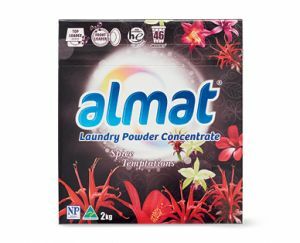 Another option for those who visit ALDI to do their grocery shopping, Almat laundry powder is a cheaper option in comparison to Trimat, with a 2kg pack priced under $5, while a 4kg value pack will set you back less than $10. Almat is also available in a number of scents, including Spicy Temptations, Soft Sensation and Tropical Escape, making your clothes feel and smell fresh. Last year’s joint ratings winner again performed strongly in our 2018 results, recording four stars for overall satisfaction, with a five-star rating for feel of clothes after washing, value for money and packaging design. For many, Fab would be one of the first brands to come to mind when it comes to the laundry, operating around the globe for decades. 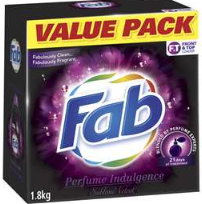 Owned by German company Henkel, Fab delivers a range of powders and liquids to take care of all your washing needs. Split into the Core Range and Fragrance Temptations, Fab offers a number of powder types for different washes. Available in 1kg, 2kg and 4kg value packs, Fab laundry powders are suitable for both front and top loader machines. With a powder for general washing and whites, Fab was one of only two brands to score five stars for scent, with a range of different aromas for you to try. Fab scored four stars for all remaining categories, including overall satisfaction. With a number of laundry detergents at different price points – including Smart Buy and Ultra varieties – supermarket giant Coles offers plenty of options for shoppers as they cruise down the aisle. Available in 1kg, 2kg and 4kg packages, Coles brand laundry powder will set you back between $4 and $6, depending on the specific product, making it a worthwhile look for households on a budget. 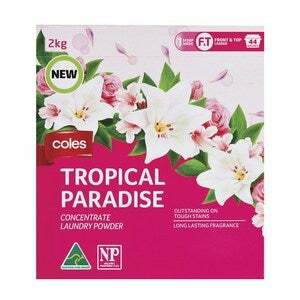 Coles’ laundry powders are said to be suitable for both front and top loader washing machines. 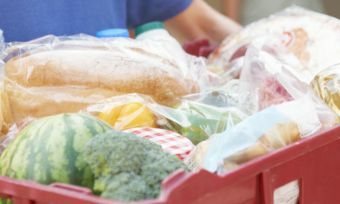 Coles was rated four stars for overall satisfaction, with three and four stars in all other areas. 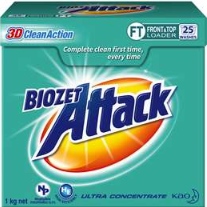 Dropping from last year’s results, Biozet Attack offers multiple laundry powders, including Regular for general washing, Rapid for those who often use the quick wash setting, as well as Plus Softener to help make blankets and jumpers that much more comfy. Available at most supermarkets and general retailers, Biozet Attack is available in 1kg, 2kg, 4kg and 6kg packages, depending on which variety you go for. 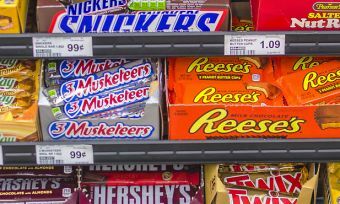 Most products are suitable for both front and top load machines, but it’s best to check the packaging before you put it in your shopping basket. Last year’s joint ratings winner again earned top marks for quality of clean and packaging design, but got three stars for overall satisfaction and value for money. Owned by consumer goods giant Unilever, Surf has been on the market since the early 1950s, offering a large number of liquids and powders for all of your washing needs. Today’s range, aptly named the 2in1, contains a built-in fabric softener and is available in a range of different scents including Herbal Extracts, Lavender, Lemons & Oranges, as well as Tropical to suit your personal preferences. 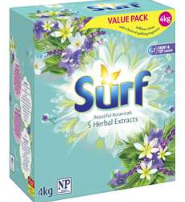 Available for purchase in 1kg, 2kg and 4kg boxes, Surf also has a Sensitive range for those with allergies, with all detergents compatible with both front and top loaders. Scoring three stars for overall satisfaction, Surf rated three and four stars across all categories in our 2018 review. 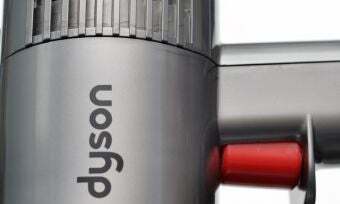 Like Surf, Omo is owned by global consumer goods company Unilever. 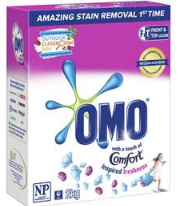 Omo’s current range contains the traditional Omo powder, Omo Sensitive, as well as Omo Ultimate for any tough stains. Available in 1kg, 2kg and 5kg boxes, Omo may be one of the more expensive options on the market, with the 1kg option setting you back close to $10 depending on where you shop. Scoring three stars for overall satisfaction, Omo got four stars for quality of clean and scent. Owned by German company Henkel, Cold Power began life in the United States in the 1960s before its global expansion. In today’s Aussie supermarkets, Cold Power is available in 900g, 2kg and 4kg packages, depending on the variety you’re after. 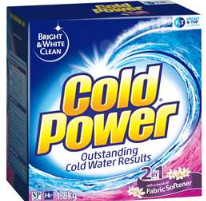 Cold Power comes in ‘Sensitive’ and ‘Regular’ powders along with special products that contain fabric softener for a more complete wash. On the higher end of the price spectrum, Cold Power is also suitable for both front and top loader machines. Consistent with last year’s results, Cold Power achieved three stars for overall satisfaction, while scoring four stars in most areas, including quality of clean. Like the other supermarket chains in this list, Woolworths offers a laundry powder alternative, with both its Homebrand option and its Essentials option readily available in stores. Available in 1kg, 2kg and 4kg packages, Woolworths Homebrand laundry powder is typically one of the cheapest detergents available, meaning it could be a handy option for households on a tight budget. It’s suitable for both front and top loaders. Woolworths Homebrand scored three stars for overall satisfaction and most other areas, but it did earn four stars when it comes to value for money. Which laundry powder should I buy? While, for some of us, the only factor that influences which laundry powder we buy is the price tag, for others, picking a laundry detergent is crucial to feeling and smelling fresh. With brands offering a range of powders to tackle any workload, households can also breathe a sigh of relief when it comes to things like skin allergies and sensitivity, with plenty of brands offering allergen-free powders for extra comfort and peace of mind. With most laundry powders now developed to work with both front and top loader washing machines, which product you decide to buy will be determined by factors such as price, scent, and your particular stance on environmental sustainability. Most brands will have ingredients information on their websites, so it doesn’t hurt to do your own research before your next grocery shop. Our ratings are based on the real-world experiences of Aussie consumers who have bought and used the brands in our 2018 review. The supermarket cleaning aisle can be a tough one to navigate, with so many laundry detergents on sale, so we hope our review proves helpful in narrowing your search. Canstar Blue surveyed 3,000 Australian adults across a range of categories to measure and track customer satisfaction, via ISO 26362 accredited research panels managed by Qualtrics. The outcomes reported are the results from customers within the survey group who have purchased and used laundry powder in the last 3 months – in this case, 1,204 people.